Individuals and couples with infertility often contemplate whether to seek counseling. Some approach this decision with ease, but many others have questions about what is involved in a counseling relationship. In today's blog, I will offer an inside view on the beliefs that have guided my counseling experiences with hundreds of infertile clients. So when I entitle this blog as "what to expect," I probably should have added "if you seek counseling from me." Since I can only speak for myself, I hope you will gain some familiarity about general principles that guide counselors and therapists (I use these terms interchangeably), as well as questions that you can ask your own counselor in order to clarify your understanding of that person's perspective on your relationship. In my own experience, my first contact with a client usually is in a telephone conversation. On the telephone I try to learn how the prospective client (almost always a woman) defines the problem(s) she wants to work on; what her partner's feelings are about being involved in counseling; whether she or her partner has ever been involved in counseling before; at what stage of diagnosis/treatment they are; and where they are currently getting medical intervention. I then offer a bit of information about myself, including possible appointment times that I have available; fees and insurance coverage information; my office location; as well as the request that both the caller and her partner come together for this first appointment. I also ask whether she has any questions that she would like to ask me before we meet. Then we set a date and time for the appointment, and I provide directions to my office. In a while you'll learn enough about my approach to understand why I ask for both partners to come to the first meeting with me; if the woman is not in a relationship, I tell her that I will be interested in learning about her support network. So here are some things that are typical of my first meeting with my new clients. It is not unusual for the person with whom I have spoken on the telephone to take the lead in introducing me to her partner and in saying something along the lines of "I think I'm going crazy!" or "I don't know how much more stress I can take." And my response to that introduction is usually to point to my nearby box of tissues and to say that being upset comes with the territory of infertility. I also try to work in something about the courage it takes to begin a relationship with a counselor, since getting help will involve talking about difficult issues. I ask both of them if they are comfortable with my taking notes as we speak, since I want to be sure to remember accurately how they portray their situations. And then I say that in my experience, each of them may have their own unique "take" on their infertility, so I will be encouraging both of them to clarify for me the dimensions of this experience that are important to them. This also opens the door for them to see each other's perspective and to learn how important it may be to keep both perspectives on the table. It is here that I say to the partner of the telephone caller how much I appreciate his/her coming to this meeting, and how much I believe that person's presence can help all of us to move forward in working on the issues connected with their infertility. I also clarify briefly the two important issues associated with confidentiality: first, that if either of them communicates something to me when the other person is not present, I will keep that information confidential until it is revealed between the partners in a meeting with me, and, second, that I observe confidentiality unless circumstances occur when I believe there is the likelihood of a client causing harm or danger to oneself or someone else. Lastly, I say that, although it has never happened in all my years of practice, if I am subpoenaed to appear in court, I might need to reveal information that had been shared with me in counseling. With those introductory remarks, I remind all of us that we have work to do, that our session will end in "X" minutes (I meet with clients for 50 minute sessions), and I encourage them to tell me how they hope I can be of help. I am careful to have both members of the couple speak about their own perspectives and to summarize my impressions of what seem to be the most pressing issues. I am interested in knowing how the couple has already tried to address their challenges and what successes and difficulties they have encountered. That will more than fill up the first session, and probably will spill over into subsequent sessions as well. Before ending, I ask the couple how they are feeling about the time we spent together today, whether they would like to return and, if so, whether this is a good time for regular future appointments, and whether I can look forward to having both of them at subsequent sessions. I tell them that after a few sessions I should be able to give them some idea of how many meetings we may need in order to address their concerns, and I express my appreciation for their openness in sharing with me today the challenges they are facing. I ask if they have any questions for me, which I try to answer as succinctly as I can. I then give them a homework assignment: for each to draw for our next session a sketch of their sources of support and their sources of stress (I mention family, co-workers, neighbors, friends, spiritual leaders and health care providers as potential people who may appear in their sketches). Now for some reflections about why I do what I do in the first session. I very much hope that both members of the couple will come to each session, since they can be most constructive in addressing concerns if they each verbalize them and if they each practice the skills that I will encourage them to develop. So I am not shy about emphasizing to both that their presence together is a big help to me. I want to hear the initial information from each of them about how they see their concerns, both so I will understand where each one is coming from, and so they will be able to hear the perspectives that each of them presents. I want to reflect back to them my understanding of their issues, so they can correct any misperceptions. I want to convey that infertility can be filled with difficulties, as they well know, and that they probably have an idea of what has and has not worked in coping with their difficulties. And, in giving a homework assignment, I want to convey that getting help is not just a 50 minute session once a week, but that they need to take away from these sessions new perspectives and return to each forthcoming session prepared to build on the new learning thay have developed. Lastly, many clients are concerned that they may be in counseling "forever." I want in the first session to convey that we can decide together how long to continue to meet and what problems we will discuss, thereby conveying that this is a partnership. Typically I am able to make substantial progress on most of the most troublesome problems over 9-12 sessions. If the clients choose, they can introduce additional concerns (or perhaps their infertility will present unforeseen issues such as pregnancy loss, an unanticipated diagnosis, etc. ), and they may choose to embark on additional sessions to deal with these new issues. Now let me look ahead broadly to how I think about subsequent sessions. In my experience, I tend to think of these sessions in terms of content and process. Content, which is presented by my clients, tends to be dominated by issues of loss and issues of communication. 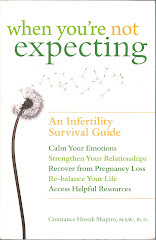 In my new book When You're Not Expecting, I write extensively about both of these, including the ways that they tend to change over the course of a couple's infertility. Process, which tends to focus on interactions, may consist of my asking the couple to discuss a difficult issue, with me ultimately giving them feedback on my observations and some clear feedback on how they can build better communication skills into their repertoire. Then I send them home with homework that will enable them to practice these new skills and report back to me the following week how they were feeling about using these skills. Learning skills in assertive communication can come in handy as well, particularly with health care providers and well-meaning loved ones. A third topic, "resources," tends to weave in and out of discussions, depending on what the couple may have presented on their initial sketches to me regarding their sources of support. From time to time I ask both clients to revise their sketches of sources of support and stress, so they can see how their communication efforts have made a difference -- OR so they can see that they need to distance themselves from unrelenting sources of stress. One of my goals is to help clients perceive themselves as part of an ecological infertility map, complete with superhighways of support and detours of stress. As a family therapist, I also consider it important to understand and discuss the roles that family members are playing in my clients' lives, especially fertile siblings and eager-to-be-grandparents. The more clients understand ways they can increase their support, the more resilient they become. I do not think of myself as a therapist who lets my clients entirely drive the counseling process. I tend to be fairly interactive in offering feedback to clients on their skills and resources. I am respectful of the social work edict "Start where the client is and stay with him/her." To me this means that I should be respectful of where my clients want to focus, but it doesn't prevent me from testing whether they are ready to be pushed to new places. If they have had an infertility intervention for months that isn't working, I am likely to push them to ask their physician to make a plan with them that includes how long to continue with one intervention before moving on to a different one. If they have spent many dollars and many years on infertility treatment, I may revisit an earlier statement that they won't consider adoption or a surrogate, by asking if they would consider collecting information about either of their previously rejected options. If I see areas of difficulty on which they have not asked for my help, I may make an observation that such-and-such an issue seems to be an "elephant in the room," and I am wondering whether there is a reason they haven't felt ready to examine it. So, even as I try to stay apace with my clients' issues, I also push and prod a bit, just to see whether new growth and resilience enables them to feel resilient enough to consider new directions. If not, I step back, and I am not surprised when, weeks later, they may raise the question of the proverbial elephant for future examination. Before closing, I will mention two last areas that are neither process or content related. The first is that, as a social worker, I believe that it falls in my realm to teach and to provide advocacy when clients are treated poorly. Occasionally, clients will report to me behavior in an infertility setting that I consider unprofessional. Often their distress is severe enough that they are considering ending treatment with that provider. In the dozen or so cases I have encountered, I have shared with the client my perception that they are on target in objecting to unprofessional communication, and that I would be more than willing either to help them think about how to address this directly or how I might (with their permission) bring this incident to the attention of their provider. In each case, the resolution has been highly satisfactory, always resulting in an apology to my clients, and sometimes resulting also in in-service training for staff so that they understand rude or dismissive remarks will not be tolerated. The second area I will mention is that, as clients and I are preparing to end our sessions, I make clear to them my continued availability if their circumstances should bring a rise in stress or other unforeseen difficulties. Sometimes clients whom I believe are ready to end our counseling relationship will be more ready to accept that encouragement from me if I offer "booster sessions" every 6 to 8 weeks, simply to reassure them that I'm there if they run into bumps in the road. So, for those of you who are contemplating seeking counseling for any of your infertility issues, I hope that my own disclosures about the way I think of the counseling experience will help you in your own interactions with a therapist. Keep in mind that not everyone shares my perspective that client partners are the first choice when providing counseling, nor that the families of the couple may be the "elephants in the room," nor that the therapist takes as active a role as I do, nor that assertive behavior with health care providers is a place for therapeutic intervention. But all therapists should be able to be clear with you about areas in which they can offer new knowledge and skills, how they observe confidentiality, and their comfort with the ever-so-present issues of loss and mis-communication. And stay tuned for the last in my Infertility Counseling blog series: Getting the Most Out of Therapy.